This week we just got back from a short five day trip to Savannah and to Beaufort in the South Carolina Lowcountry. I will share some of our travel notes, photos and how we went about our trip as a new feature of Boomer Travel. This is a great getaway of about 5 to 7 days. For those in the Southeast or anyone passing through, this trip is begging to be taken. We started in Atlanta and took drove down I-75 down to Macon and then I-16 over to Savannah, the oldest city in the state of Georgia. Driving time is a little over 4 hours, not bad at all. We left Atlanta Friday morning and arrived early afternoon in the Savannah area. Actually on this trip we attended a family reunion in the Savannah area town of Richmond Hill, but you could visit Savannah for this part of the trip which we spent Friday and Saturday. It’s nice to have local guides so after checking into the Holiday Express near I-95 in Richmond Hill we visited then went to dinner at a local seafood restaurant. Got to have shrimp in Savannah. There are 729 Seafood Restaurants in Savannah on Tripadvisor.com so you won’t have any trouble finding one. The Olde Pink House is a great historic restaurant in downtown Savannah and tops the list. On Saturday we visited historic Fort McAllister Park which is a wonderful State Park in Richmond Hill. Such a nice day, thankfully after a short visit to their museum and a short video, we spend most of our time walking the grounds among the giant live oaks with Spanish moss and viewing the salt marsh and the Ogeechee river. Very relaxing. There are campsites and a few cottages available for a longer stay. 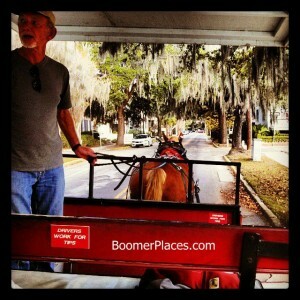 On your first or second day in Savannah you could take one of the many tours, like the Old Town Trolley Tours of Savannah which we have taken on a previous trip. You can see the City Market, River Street, the squares and the impressive homes of the Historic District. There are specialty tours also. Highly recommended. Here is a list of the Most Popular Attractions in Savannah GA.
Back to our trip, we departed Savannah Sunday for the 50 mile trip up I-95 to Beaufort SC which takes only about an hour with no stops. We did pass near the Boomer retirement community of Sun City Hilton Head but didn’t stop; maybe next time. We had a two night reservation at the City Loft Hotel in the Historic District and that turned out to be a fine choice. You can walk to everything. When making a reservation, check out their Specials on their web site. We got a good rate for two nights plus a bottle of wine. There is the City Java shop on site which has the best coffee in town and the Lowcountry Produce Market & cafe is right across from the hotel on Carteret Street, a great place for breakfast or lunch. Beaufort has a lot to enjoy from being right on the Beaufort River which is part of the Intercostals waterway, to nice restaurants, seafood, walkable Historic section, great old houses and more. Seafood is a specialty of the area, especially shrimp, oysters and fish. Many of the restaurants have back decks with views and people watching especially those located on Bay Street and backing up to the Beaufort River. 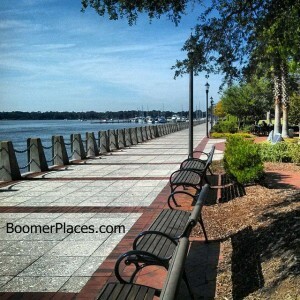 Walking in Beaufort’s Historical District is really great, both the commercial side and the residential neighborhoods. I found a friendly and safe environment. The last two weeks of October there is a Ghost Carriage Tour of the neighborhoods of the Historic District. The carriage and guide are in costume and you proceed in the horse drawn carriage along street cover with Spanish moss draped trees with an assortment of characters coming out to greet you as you ride by. This is an adult event; there was a group from Sun City Hilton Head on our tour. They run every 30 minutes starting at 6:30pm up until around 9pm. Get reservations. We came back the next day and did the regular Carriage Tour which took us by these great old homes including many which have been in the movies. 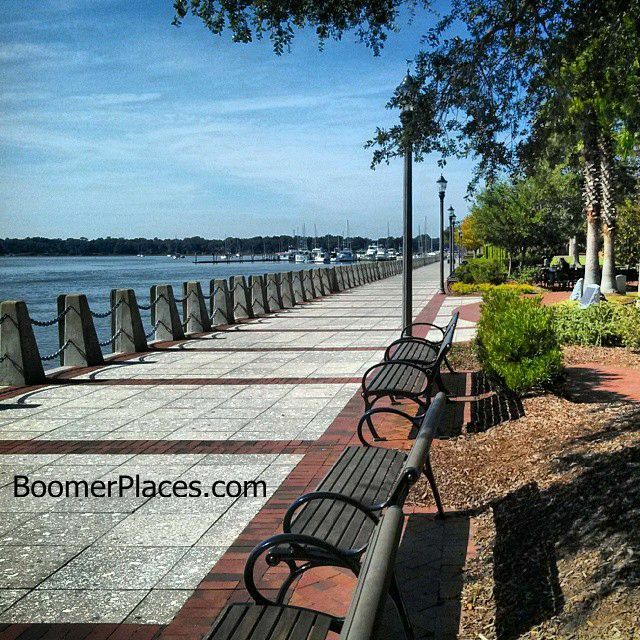 Take the bridge from the Historical District over to Ladys Island on the Sea Island Parkway. Try the Dockside Restaurant on the left side of the highway on Ladys Island for seafood and a view. 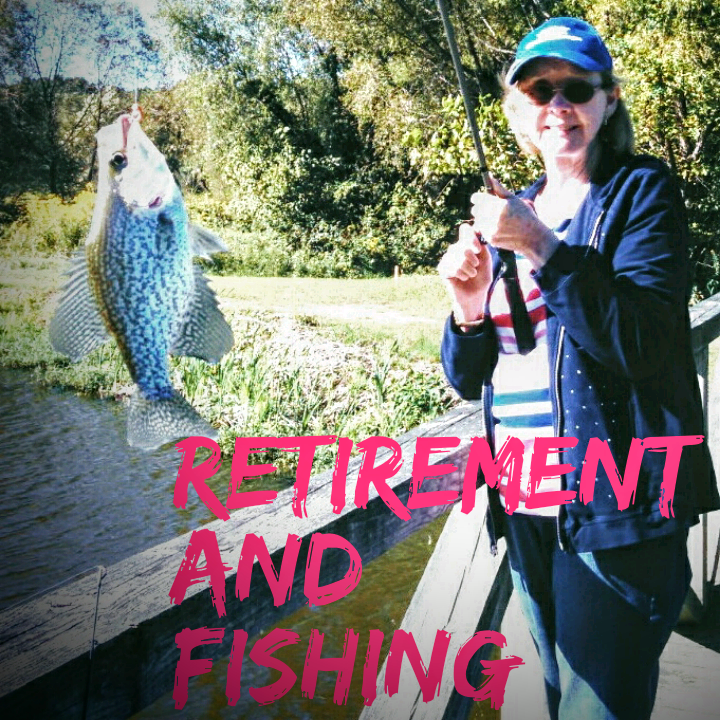 A lot of retirees live in several large upscale communities on Ladys Island. Many local markets for produce and seafood. From Lady’s Island continue on the St Helena Island. Turn right at the historical district sign and continue down awhile to see the tabby ruins of St. Helena Parish Chapel of Ease Ruins. Back on the Sea Island Parkway continue on to Hunting Island State Park and the well preserved historic Hunting Lighthouse, which is 136 feet tall. Entrance fee to the park is only $5 per person. 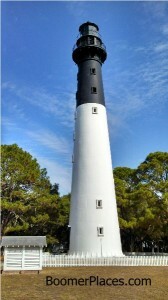 There are other Sea Islands to be explored as well if you have the time. After our three days in the Lowcountry frankly we were not ready to come back. You would spend three days in the area or longer. Savannah is a gorgeous place, and there’s a ton of stuff to do. You’re absolutely right that you can walk to almost all of the attractions as well. I love cities and other tourist destinations that you’re able to go to and just walk everywhere you need to go. Savannah once and walked to restaurants and took the city tour, which is great. Savannah is a gorgeous place, and there’s a ton of stuff to do. You’re absolutely right that you can walk to almost all of the attractions as well. Having just moved here, I agree that Savannah is absolutely beautiful. I just wish it weren’t so humid. 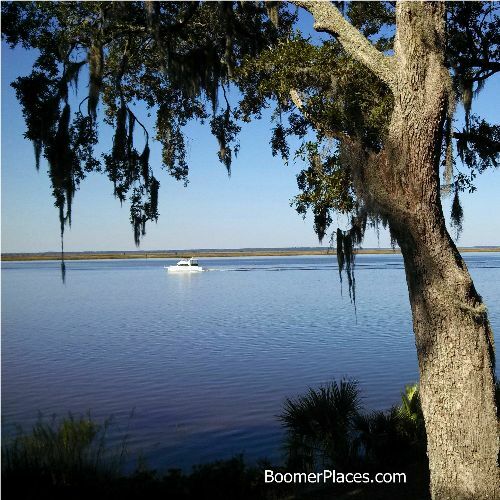 Being a resident of Hilton Head Island since 1972, I can tell you that Hilton Head, the Lowcountry and Savannah are places that you just cannot beat. My family and I love it here. There is so much to do along with being so rich in history. My business has thrived probably because people can tell my enthusiasm of living in a place that is so wonderful. We love the restaurants, the beaches, the amazing culture and the people. I am happy to be here and wouldn’t leave it for anywhere else. I love visiting Savannah for the history, dining/drinking and shopping. The last time we were there we ate brunch at The Pirate’s House and then spent the day walking around the Historic District and the night at the waterfront area. Very nice weekend trip for us since it’s not such a long drive from Myrtle Beach. I would definitely concur with the Pink House recommendation in Savannah! It’s one of my favorite restaurants in the US, if not the world, and I’ve done a lot of traveling! If you’re a foodie, I’d also highly recommend Charleston, SC. Almost impossible to get a bad meal there.